Sophie Buck, Blueprint Arts Editor, interviews Jemima Poffley, who is studying French at Oxford University, about her artwork. How would you describe the art you make? The art I make is very personal and closely linked to how I feel at the time of creation. I work a lot in both drawing and photography. Drawing in my sketchbooks feels like a radical act of intimacy and vulnerability. I am always accompanied by a small sketchbook, and it feels like a secret space which is mine to occupy. I create characters and often include written asides alongside my drawings. These are either brutally honest or darkly sarcastic. Meanwhile, photography enables me to directly capture what I see, and thus communicate intimate details I notice in my environment. I obsessively focus on the human form. My art is often connected to the body. Working with my own body is a powerful way of gaining agency over it and its presentation; I have made sculptures that interact with my body and used them for performances and to make films. When did you first start making art and/or this type of art? Why? I have always made art, but I am working to release myself from the burden of ‘objectively’ good art. In school, a ‘good’ piece of art was figurative and photographic, whilst in art school, it was clever and self-conscious. I want to withdraw from both of these and make art that is personal. My sketchbooks allow me a space for experimentation without judgment. What/who motivates or inspires your art? Where do you find inspiration? For me, creating art is an essential part of my life. I am inspired by what I see in my environment and by what I experience. I enjoy taking images from books I have read, or little snippets from conversations I have had. I love looking at other artists’ work and talking to them about their creative processes. It’s also important to me to speak to friends who work and study in very different areas. Art should not be separate from life, but intimately part of it. Are there any pieces of art that have had a particular effect on you? Rubyetc’s comics have endlessly helped me visualise my own mental health problems, and laugh at them, which is helpful in managing them! Other artists I have found on Instagram who deal with mental health with humour include Silvia Carrus (@silviadoesdrawings) and Gemma Correll (@gemmacorrell). 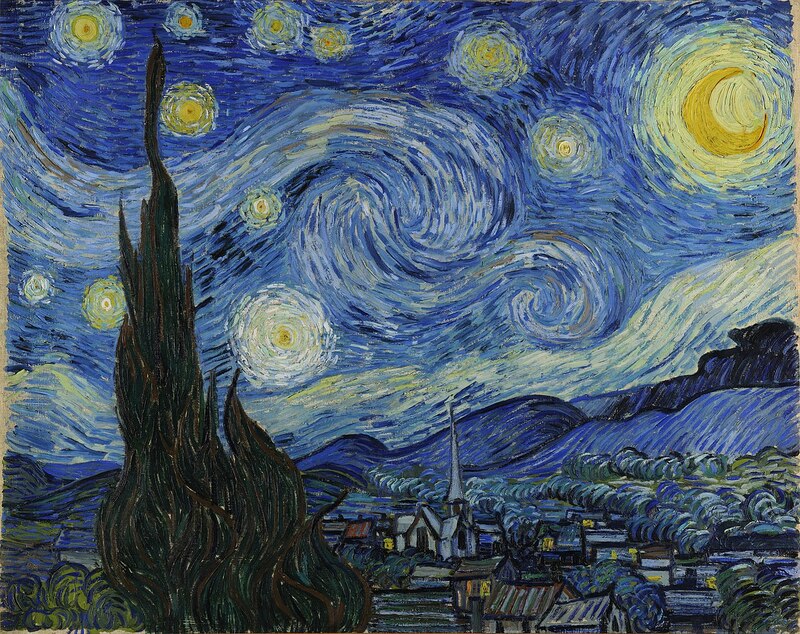 Van Gogh’s Starry Night is my favourite painting. The swirling texture of the piece draws me in and pulls me out of myself. I love art that makes me feel the process of creation; all the visible brushstrokes show the human reality of how the work was made. The recent painted animated film Loving Vincent visualised this luxurious texture, but it also dealt with the dark reality of the artist’s death. In terms of literature, Proust’s Á la Recherche du Temps Perdu (‘In Search of Lost Time’) has been impactful. Proust masterfully elucidates exactly how things look and feel. He also created one of the most pertinent descriptions of anxiety. I appreciate art that is prepared to engage with emotions and be intimate. Children’s illustration is also something which comforts and inspires me. As well as their nostalgic power, they often promote messages of self-care. Tove Jansson’s Moomin illustrations provide me with a beautiful form of escapism. In what ways do you think the arts are important for mental health? Art can allow artists to work through their own mental health problems. It gives you the power to construct your own identity as an artist and so gain a sense of purpose and fulfilment. Also, by putting something out into the world you invite dialogue with others, which combats the isolation of mental illness. Art has allowed me to meet people and become part of a creative community. Has art helped your health and wellbeing? If so, in what way? Yes, I think so. It’s given me a fixed identity when everything else feels shaky and it has allowed me to feel whole and powerful in my body. How do you feel when you’re making art, and/or after you make art? Sometimes when I make art I feel calm and the process is meditative. Working with physical materials can be grounding, and working with my body is exciting and empowering. At other times, it is a struggle against perfectionism. In calm moments, when I look back on everything I have made, I feel proud of having put all these little fragments of myself out into the world. Would you say your art is political? Why? I believe it is to a certain extent. Whilst I have not made much explicitly activist art, which is something I admire and might try to include in my practice in the future, I try to promote a certain anti-productive ideology in my work. I believe that you can make art for the sake of making art, for your own enjoyment, and that no strand of artistic expression is ‘lesser’ than any other. I believe in creating systems that operate independently of art schools and the art market, allowing more people access to the arts. Do you have any links to more of your work you want to share? I often update my Instagram (@jemimapoffley) with new sketches and photography! Should Cambridge students speak on behalf of all autistic people?